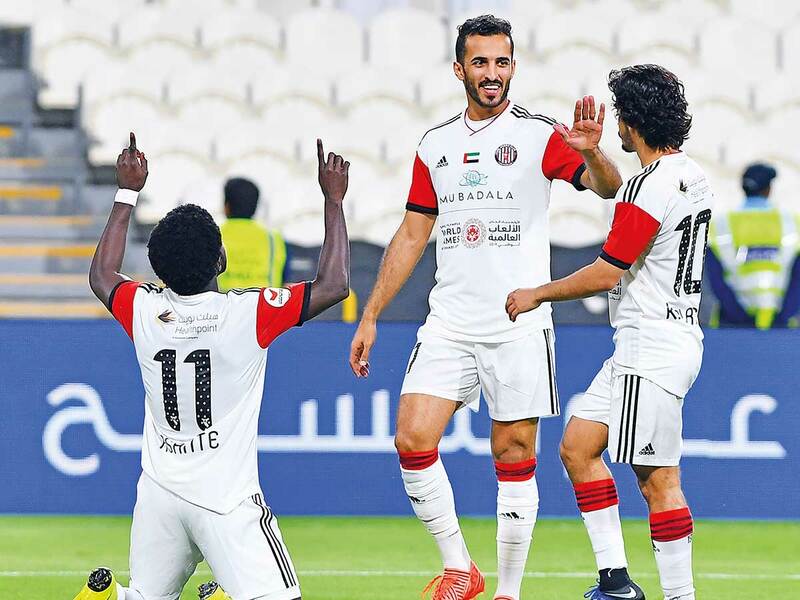 Abu Dhabi: Ali Mabkhout equalled former UAE captain Mohammad Omar’s goalscoring record of 132 goals in the UAE league as Al Ain’s title hopes were severely hit after they were handed a humiliating 5-1 defeat at the hands of Al Jazira in the Arabian Gulf League on Wednesday. Al Ain having dropped three crucial points temporarily retain second place with 38 points, eight points behind leaders Sharjah. Al Jazira with 37 points jump to third place. Mabkhout can now set his sights on the all-time record held by Fahad Khamis, who scored 165 goals in the league. “I’m delighted and very proud of my team for the way they played,” said Al Jazira coach Damien Hertog during the post-match press conference. Hertog was also full of praise for young players such as Mohammad Al Attas, Abdullah Ramadan and Khalifa Al Hammadi. “They gave their best. They showed they can play at the top level in this league and it’s great to see them develop,” he said. The hosts shot into the lead within just three minutes through Ernest Asante after being set by Mabkhout. The latter then himself got into the scoring act two minutes before the half-hour mark to put the Pride of Abu Dhabi 2-0 up. Al Jazira then lost the services of Khalfan Mubarak in the 41st minute due to injury and was replaced by Nacer Barazite. Immediately after that, Al Ain reduced the margin through a corner from Brazilian Caio. His pinpoint release was nodded home by an unmarked Esmail Ahmad. Al Jazira’s response was also immediate as they made it 3-1 before the breather. Substitute Barazite curling the ball past a rooted Al Ain goalkeeper Khalid Eisa after being fed by a measured pass by Mabkhout. Just three minutes after the change of ends, Jazira struck again through a counter. Asante scoring his brace off a Sebastien Siani’s pass by dribbling past the Al Ain defender and beating an onrushing Eisa. Caio and Marcus Berg tried their level best to reduce the margin but were kept at bay. Mabkhout then made it 5-1 with another clinical finish after being set by Barazite in the 79th minute.